1. Preheat the oven to 200˚C, gas mark 6. Piercethe aubergine all over with a fork and bake for 35-40 minutes, until blackened. Put in a bowl, cover with cling film and leave for 10 minutes. 2. Meanwhile, dice each lamb steak into 5 equal pieces and mix in a bowl with 1 crushed garlic clove, ½ the lemon juice and 1 tsp oil. Leave to marinate for at least 20 minutes. Thread onto 2 skewers (pre-soaked in water if wooden). Cook on a hot griddle (or barbecue) for 8-10 minutes, turning often, until cooked through. 3. Halve the aubergine and scoop the flesh into a food processor (discard the skin). Add the tahini and remaining garlic and lemon juice. Blend until smooth; season. Cook the grains according to pack instructions; toss with the lemon zest, herbs and remaining 1 tsp oil. 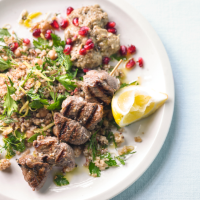 Serve the lamb with the grains and baba ganoush; scatter with the pomegranate seeds. These handy, ready-cooked mixed grains are packed full of fibre.